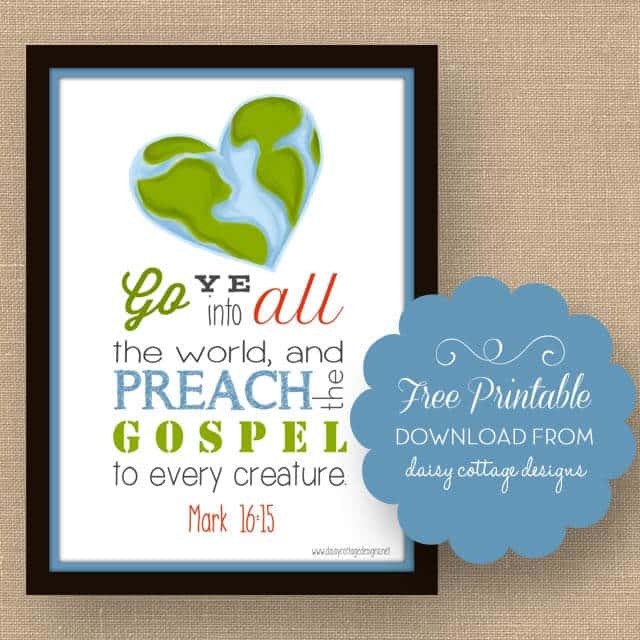 This free Bible verse printable is my favorite design to date. As I’ve said before, I’m no graphic designer, but I’ve been enjoying making these prints for the gallery wall that will be happening in our addition (if that addition ever gets started… permits should be ready this week). I’m not quite sure where this collage is going to go, but I’m slowly but surely putting together a collection of artwork that will represent what’s important to our family. Telling others about the love and mercy of our wonderful Savior, Jesus Christ, is one of the most important things we do as a family. 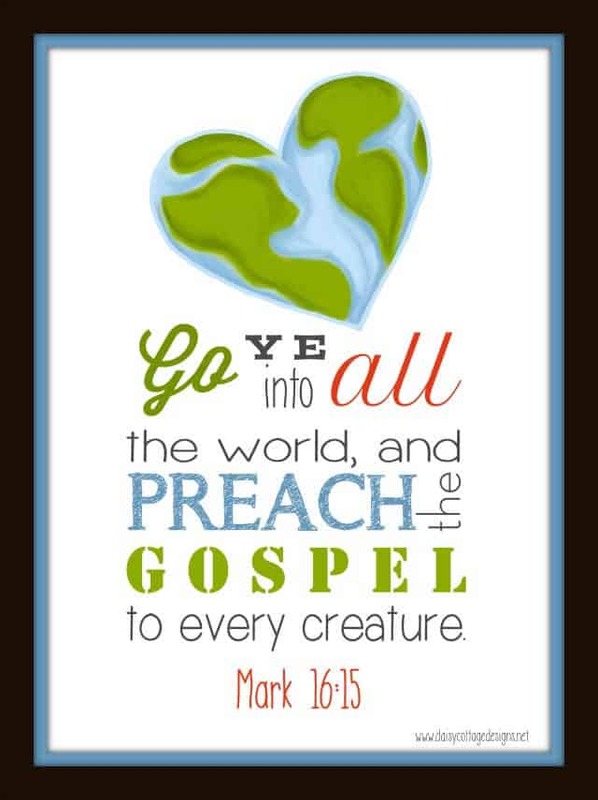 This verse, known as the “great commission,” is something that we try to live out on a regular basis. Sometimes it’s not easy to be bold with our faith. Talking about religion is often considered taboo; people are afraid of being offensive. This verse is a great reminder: regardless of what others think, we still need to share the good news. I’m constantly amazed at the number of people who contact me because of the blog. So many are blessed by the fact that I openly share my faith here. Believe it or not, I’ve never gotten one email saying, “Hey, I love your projects but would you keep your beliefs to yourself?” I appreciate that. If you’re not quite sure what “the gospel” is or why it’s so important that Christians “preach” it, please see my explanation here. If you would like to display this verse in your home, please feel free to download the free 5×7 print here. I love this verse also, and in light of world events over these past several weeks, this is one of several verses that has so much meaning today in our broken world. God Bless you, your family, and the ministry of spreading the Good News. Your graphics capabilities are quite impressive – so keep up the good work and consider creating a large banner with your design. The kids will LOVE it! I understand you are in FL. I attend an incredible church in N. CA, called Bayside which is led by Pastor Ray Johnston with a congregation of 11,000 and growing. We wish you and your family God’s continued blessings. And thank you for your blog. Have really enjoyed some of your wonderful crochet creations. Thanks, Michele. It’s a blessing to have a great church, isn’t it? Wow! 11,00? That’s huge. 🙂 We’re relatively small, but it’s still a fantastic church. Thanks so much for the sweet comment. It was a blessing and an encouragement.